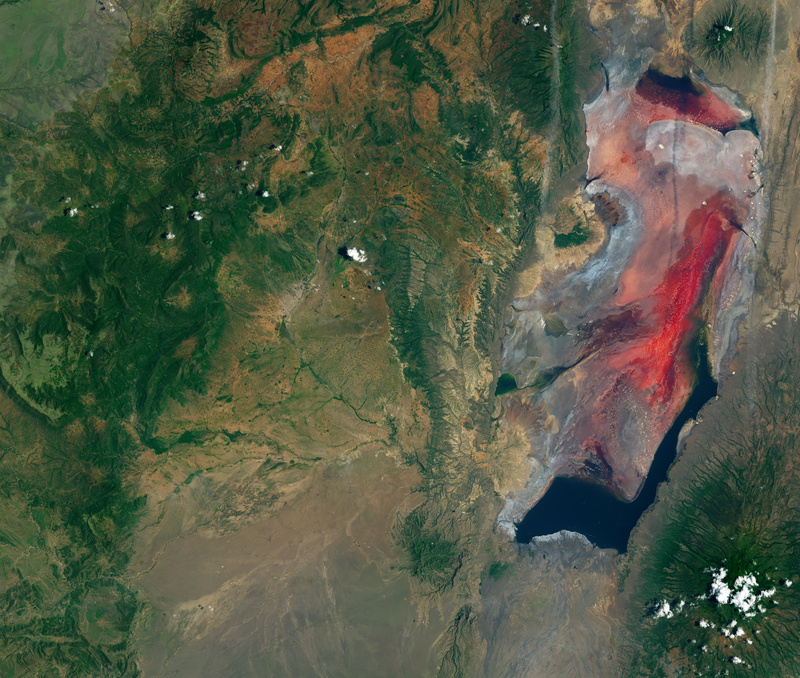 Not many people venture near the shores of Lake Natron in northern Tanzania. The lake is mostly inhospitable to life, except for a few species adapted to its warm, salty, and alkaline water. But you don’t need to visit the lake in person to see its stunning, seasonal color. 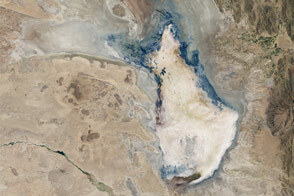 The Operational Land Imager (OLI) on Landsat 8 captured these natural-color images of Lake Natron and its surroundings. They show the lake on March 6, 2017, very early in the rainy season that runs from March to May. 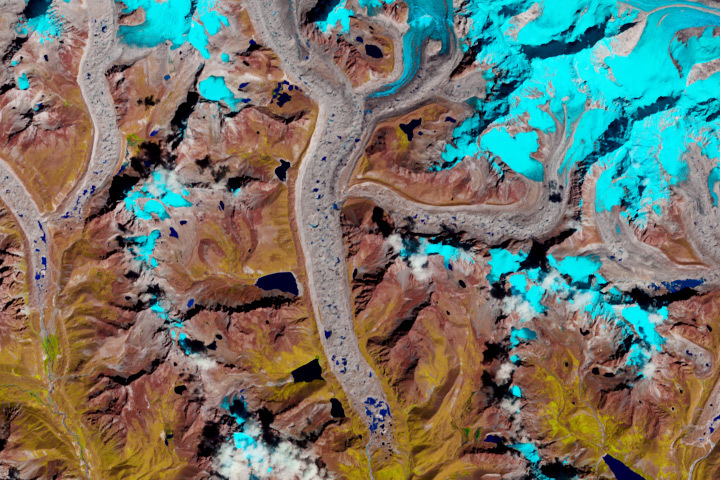 In these images, you can see the deepest water along the perimeter of the lake bed, the location of lower-elevation lagoons. The climate here is arid. In a non-El Niño year, the lake receives less than 500 millimeters (20 inches) of rain. 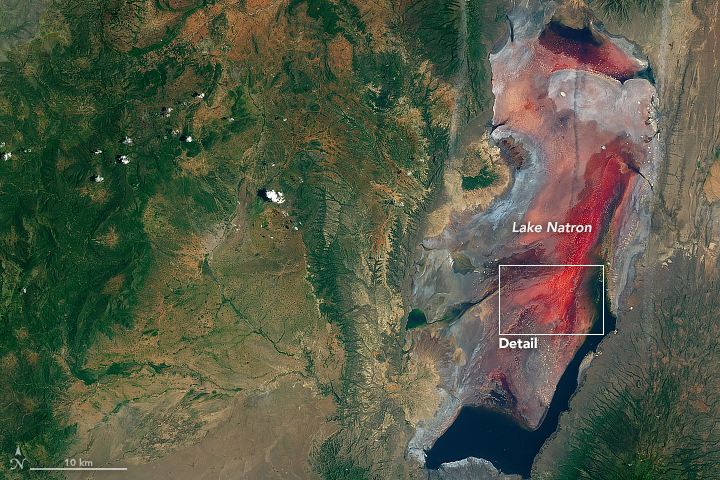 Evaporation usually exceeds that amount, so the lake relies on other sources—such as the Ewaso Ng’iro River at the north end—to maintain a supply of water through the dry season. But it’s the region’s volcanism that leads to the lake’s unusual chemistry. Volcanoes, such as Ol Doinyo Lengai (about 20 kilometers to the south), produce molten mixtures of sodium carbonate and calcium carbonate salts. The mixture moves through the ground via a system of faults and wells up in more than 20 hot springs that ultimately empty into the lake. 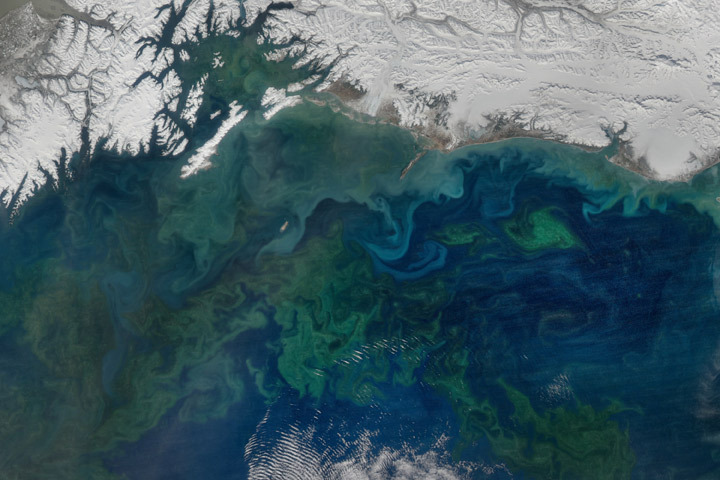 While the environment is too harsh for most common types of life, there are some species that take advantage of it. 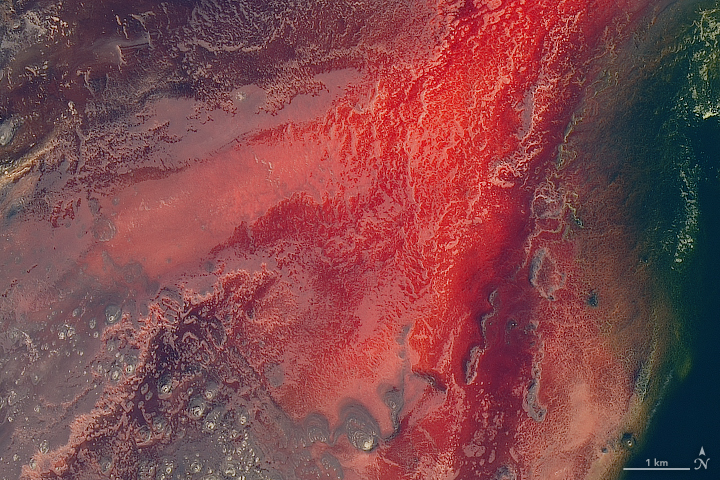 Small, salty pools of water can fill with blooms of haloarchaea—salt-loving microorganisms that impart the pink and red colors to the shallow water. And when the waters recede during the dry season, flamingos favor the area as a nesting site, as it is mostly protected from predators by the perennial moat-like channels and pools of water. The lake is mostly inhospitable to life, except for a few species adapted to its warm, salty, and alkaline water. 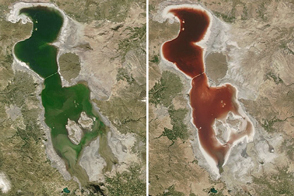 Atlas Obscura Lake Natron. Accessed May 5, 2017. Grant, W. D., and Sorokin, D. Y. (2011) Distribution and Diversity of Soda Lake Alkaliphiles. (Springer Japan). Warren, J. K. (2006) Evaporites: Sediments, Resources, and Hydrocarbons (Springer Berlin Heidelberg).